JEDDAH: The Saudi Food and Drug Authority (SFDA) has called on members of the public not to use Rolana Baby Shampoo after one baby died and 13 others fell ill following its use. The SFDA is now working with the Ministry of Health to follow up on the locally manufactured baby shampoo, which it says is polluted with serratia marcescens, a type of germ that can cause toxemia, meningitis, conjunctivitis, and inflammation of urinary system, which may lead to death. Speaking to Al-Eqtisadiah newspaper, Tariq Madani, a professor at King Abdulaziz University’s Medical College, said 14 babies had fallen ill after using the shampoo and that one has died so far. Madani said the university would lodge a legal complaint against the manufacturer, Al-Hayat Factory for Medical Products in Dammam. He added that the father of the baby who died is also lodging a complaint against the factory. Madani said the hospital has acquired 15 boxes of the polluted shampoo and that there is a need to take legal action due to the factory’s neglect. He added that the babies affected only started using the shampoo four months ago. He also said the pollution could be caused by polluted water. “This is unjustified. The public’s health is at risk,” he said. A source at the Ministry of Health who preferred anonymity said the problem is only in one batch of shampoo carrying the production number: 46504058. He added that as a result only shampoo bottles carrying this number should be removed from the market. 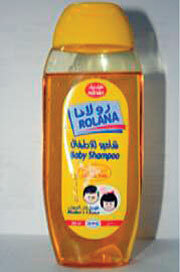 “We have received a number of cases from various regions of the Kingdom all of those affected used Rolana Baby Shampoo. We will take samples and examine them to ascertain the product’s safety,” he said. Omar Abu Shihada, general manager of Al-Hayat Factory, said previously that the factory complained to the Ministry of Health and the Ministry of Commerce about defamatory remarks about the company’s products. “We have been producing the product and selling it for Aramco… for 20 years. Aramco teams regularly examine the product along with teams from the Ministry of Health, and the product has never been found to be polluted,” he said.